Is your cat dapper and sophisticated? (You know, using designer clothes to sharpen claws and only eating wet food.) 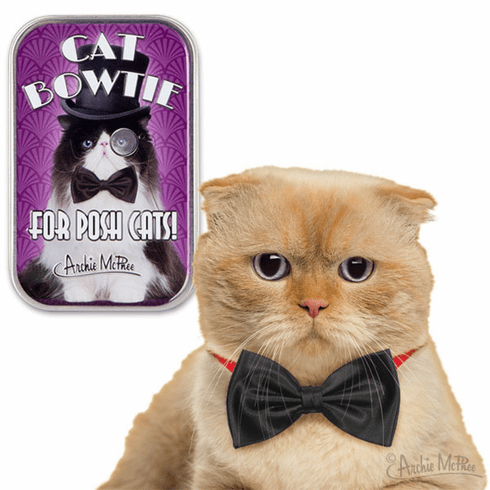 Well this Cat Bowtie lets the world know theyêre dealing with one classy kitty. Made of silky black fabric with elastic band on the back, this 3-1/2" (8.9 cm) wide bowtie is designed to slide onto a cat-sized collar. Comes in a 3-3/4" x 2-1/2" x 3/4" (9.5 cm x 6.4 cm x 1.9 cm) illustrated tin. 12 shrink wrapped tins in each illustrated display box.